This is one of the finest Procol Harum's works, and perhaps the last one that you can define as brilliant. After the artistic.commercial success that their previous 'Live' achieved, Brooker decided that it was a good idea to keep the pomp-and-circumstance momentum to a certain degree, as the opening title track shows you: Lizt-like romanticism, orchestral waltz, minuet, all comprised within the typical structure of an art rock song. More of this can be found in ellegantly articulated pieces such as the OST-oriented 'T.V. Caesar', the dramatic 'For Liquorice John' (an overwhelimg portrait of self-destruction and suicide) and the baroque-driven 'Fires (Which Burnt Brightly)'. Passion flows on without bursting out of measure in 'A Rum's Tale', a captivating bluesy ballad. But there's always room for humour and irony, as you can notice in: the fake high spirit of the broken-hearted 'Toujours l'Amour' (the single, actually); the country parody 'A Souvenir of London', which revolves around a secret V.D. that one has to hide from his wife; the playful 'Bringing Home the Bacon'; and the tropical poppish 'Robert's Box'. With Fisher out of the band some years earlier, and Trower gone since the closure of the 'Broken Barricades' tour, Brooker (with lyricist Reed's full consent) is now 100 % free to take absolute creative control over the band's repertoire: pros - an easier quest for stylistic coherence and conceptual pursuits in song writing; cons - a danger of creative exhaustion and a tendency towards self-repetition. Fortunately, in 'Grand Hotel' it is not exhaustion, but grandeur that still reigns in the kingdom of Procol Harum. After some harder rocking studio albums and this surprise live album in Edmonton ( of all places) , Brooker was freed from Robin Trower ( great solo carreer) and there was no holding him back anymore and he was able to unleash all of his grandeur using the philarmonic orchestra as a single instrument and writing with that in mind . This is where most other pompous prog musicians failed, as they were content toying around with an orchestra where as Brooker knows exactly what to do with it. This has been thought of as a concept album but not so say Brooker although one might imagine a link in between the songs . The title track , TV Caesar , Liquorice and Fires are the better numbers but if you listen well , all of them are winners . Although " Grand Hotel" may not be generally viewed as one of the very best of the Procol Harum albums, and is in a way a bit retrogressive (going back to the sound of " Procol Harum", " Shine On Brightly" and " A Salty Dog", instead of following the more adventurous path of " Home" and " Broken Barricades"), and although the band already lost some key members, the album is actually one of their very best. The orchestral grandeur of the first three albums is being perfected here, and taken to a logical end conclusion. Maybe the album misses some of the rough edges of the earlier albums, but that is fully compensated by the music itself, which just takes you away, with all it's melodies, harmonies, and richness of sound. Although they weren't cutting edge progressive anymore in the days of the making of the album, innovation is still around, there is definitely "soul on board" and the lyrics (" words" ) of Keith Reed are sharp tongued as always. I'd say that the title track is the biggest highlight on the album, both musically and textually. Symphonic grandeur at it's very best. The whipped cream on the cake is the fantastic artwork. Grand Hotel: grand band. If you wish to indulge yourself, you know what to buy. Grand Hotel was recorded with a new line-up featuring Plastic Penny's Mick Grabham on guitar and bassist Alan Cartwright alongside vocalist/pianist Gary Brooker, stalwart drummer B.J. Wilson and Chris Copping who by now was concentrating exclusively on the organ. At the time of its creation, the band was experiencing something of a surprising renaissance thanks to the hit single Conquistador and rave reviews of the Live In Edmonton album. 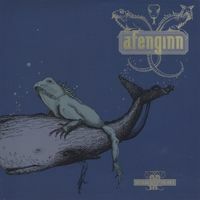 They responded with a classy album that extended the middle finger firmly in the direction of the band's many detractors. There are many highlights on what is a very consistent album. 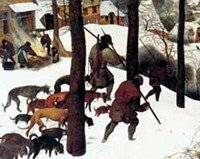 The powerful title track is an opulent orchestral work-out similar in style to (although just not quite as good as) the classic track A Salty Dog. There's a lovely waltz break, and some Gothic choral vocals that give the piece real character. Toujours L'Amour is a powerful rocker with a lovely emotive guitar solo from Grabham. Bringing Home The Bacon is probably even better, with has some sizzling organ sounds and the odd piano run ... I love the solos on this one. A Rum Tale and For Licorice John are quintessial melancholic PH piano rambles, and while I've never been totally convinced by the TV Caesar chorus, it does have some very nice moments. There's also A Souvenir Of London which is a light-hearted tale of venereal disease, with a rather un-Procol sound ... loads of mandolin and ukelele if I'm not mistaken, with a bit of a skiffle beat. While I'm not fond of the lounge, almost bossa nova feel of Robert's Box (the only track here I don't like), Fires (Which Burn Brightly) is another underated classic PH tune, that concludes with some spectacular vocal acrobactics from guest chanteuse Christiane Legrand. How come Procol Harum have so few reviews? I'm not expecting them to be in the top league among proggers, but at least I always thought they are very widely known. Shine On Brightly (68) is a milestone in prog as it has side-long 'In Held 'Twas in I'. What everyone knows are of course songs like 'Whiter Shade of Pale' and 'A Salty Dog'. They made an album each year up to 75's poor Procol's Ninth; I pick this one to be their best. Earlier albums have both great songs and some rough bluesy or rocking numbers I've never liked, whereas Grand Hotel is an elegant, well produced work easy to enjoy. Fisher's and Trower's absence may indeed have more pros than cons at this point. Gary Brooker and lyricist Keith Reid are in good shape here, and the sound is tidy and orchestral. My favourite tracks are the grandiose title song, romantically naiive and simple 'A Rum Tale' and 'Fires (Which Burnt Brightly)' with a soprano guest voice and classical music flavour. I'm hesitating between 3 and 4 stars: as some tracks have faded from my memory I suppose 3+ will do. But no prog fan should ignore them as one-or-two- hits-dinosaurs. Recorded at a time when the band's star was waning rapidly, "Grand hotel" is actually a highly credible effort, with many fine melodic tracks. Gary Brooker's highly distinctive vocals dominate proceedings as usual, accompanied by a much changed line up from their previous studio album. The most significant change is the departure of guitarist Robin Trower, replaced here by Mick Grabham. The result of these changes was that Procol Harum effectively became Gary Brooker plus any other musicians he appointed. Keith Reid was still on board as lyricist, but it was Brooker who dictated the sound of the band. The albums kicks off with the majestic title track, which slowly paints a picture of the days when no expense was spared when building luxury hotels. The track is surprisingly progressive in structure, Brooker's orchestration (not to mention 22 mandolins!) enhancing the Ritzy feel of the piece. As a rule, Brooker focuses on ensuring that the songs here have strong melodies. Tracks such as "A Rum tale", a sort of sequel to "A salty dog", and "TV Ceasar" are carefully crafted and highly enjoyable pieces. They are relatively straightforward compositions with little real development, but the detailed arrangements give them a warm depth. The latter sees Brooker giving one of his wonderful, full range vocal performances. Mick Grabham takes the opportunity to show that he too is a highly accomplished guitarist on the upbeat "Toujours L'Amour", although the song itself is one of the less memorable Procol Harum songs. The second side of the album sees the quality dip slightly. "A Souvenir of London" is the quirky sort of folk tale (of an embarrassing disease) sung by pub singers up and down the country. "Bringing home the bacon" is another example of a basic song considerably enhanced by the arrangement. "Fires (which burn brightly)" is considerably enhanced by some wonderful vocalising by Christianne Legrand (of the Swingle Singers), her delicate voice contrasting perfectly with the gruff tones of Brooker's. In all, "Grand Hotel" is a fine album which has not enjoyed the recognition it deserves. It is a perfect example of how good arrangements can transform average compositions into high quality songs. "Grand Hotel" is often considered as the most polished album of the band: their best achievement and the one which remains into the memories of oldies like I am. Like Matti, I also regret that so few reviews with comment are available on PA for such an emblematic work. Brooker has now the full command since Trower's departure. Most of the members featured here were already present on the grandiose Edmonton affair. There is one masterpiece of music on this album. I am referring to the title and opening track of course. A fantastic journey into "Procol Harum"'s world. An opera on its own. A brilliant moment of music, full of classicism, wonderful orchestration (and when you know my aversion for this type of mix, it is even more to be highlighted). And Brooker's voice fits perfectly well this type of song. Grand Hotel is a fine album with its pieces of emotion ("A Rum Tale", "Bringing Home the Bacon", another highlight IMO), some fine melodies ("T.V. Caesar" and its good old organ sound). And some weirdoes as well ("A Souvenir Of London"). What I miss in this album is the great organ sounds of their first couple of albums and the great guitar job of Trower. Still, a song as "For Liquorice John" is fully in line with their best work. The cold darkness of this song is absolutely wonderful. Sounds as a nice and melodic little song but is all dark and death. Another highlight. Actually, this album is extremely pleasant to listen to. Very few weak songs (only a couple), and those wonderful melodies which are the trade mark of the band ("Fires"). There is little risk that one shouldn't like this album. If 10CC is amongst your liking, you should be very receptive to "Grand Hotel". The excellent closing song Robert's Box only adds to the feeling. Wohw! Dutch PA collegue progrules sold me some of his old vinyl section and this is one of the finest adds to my collection. Well, lets start at the cover. It's so gentle, so elegant. The cover is actually so good that it makes the content of this record even more elegant. BTW, if you look at the glass of champain on the back of the cover you can find a lot of elements that are visually impossible. Overall the music on Grand Hotel is gentle, bombastic, symphonic and ofcourse progressive. The songs Grand Hotel, T.V. Ceaser and Firess (which burnt brightly) are true epics of great significance. Everyting is there: piano's and organs, guitars, bass and drums. But also orchestral sounds and choirs. The music is composed with chordbased systems, but the progressive parts are done with a lot of modulations wich make the music exciting. This way no cheasy parts are present. The opening song Grand Hotel is a bombastic semi-classical extravaganza with great vocals and melodies. One of Procol's most exciting songs ever. The classical themes are played with an orchestra and they fit in perfectly with the gentle lyrics about this nice hotel. The atmosphere of this song accompanied with the artwork makes this a song wich alway takes me to a fantasy world of glitter and glamour. A masterpiece! TV Ceasar is an epic with a lot of chord modulations that keep you focussed on the song. 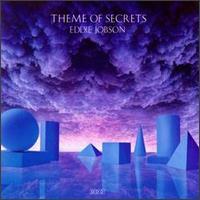 The theme get higher and higher and Gary Brooker's vocals keep getting more intense every moment! whowh.. this sound is almost to much for my stereo! I wished Holland had a national anthem like this. Fire wich burnt brightly is another epic. Accompanied by the great vocals of Cristianne Legrand. This song has a more serious vibe then the other epics, though it has the same symphonical sound. The vocal solo of Legrand is something that is very well thought off. Two other songs that are nice are A rum tale and A souvenir from Londen. Both are lyricly interesting and even funny. Always when I'm listening to this record I get such a good feeling. Your own house becomes the grand hotel itself! For this remarkable effort of elegence I can only give five stars! Recommended to everyone who likes or even dislikes symphonic music. All my friend even liked it, even the metalfans among them. Crossover at its best. EDIT: Though I still think this is a great album, I changed the rating to four stars. I have to be cautious with my masterpieces! 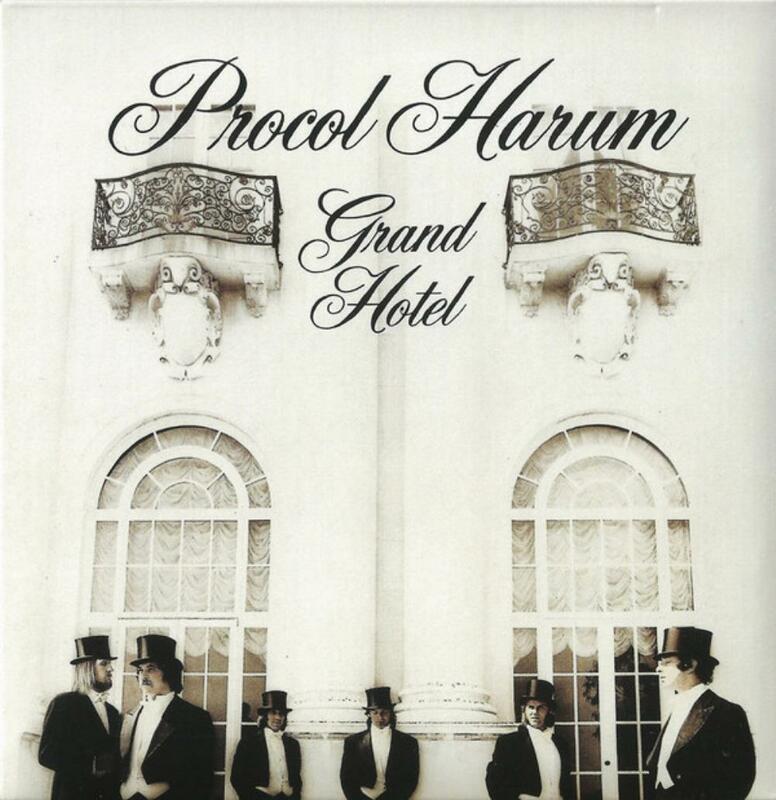 "Grand Hotel" is the 6th full-length studio album by UK progressive rock act Procol Harum. The album was released through Chrysalis Records in March 1973. The band did not release a studio album in 1972, but instead released the live album "Live In Concert With The Edmonton Symphony Orchestra". And it seems the band have taken a particular liking in the symphonic element, because the use of symphonic elements is continued on "Grand Hotel". The last couple of studio albums were more blues rock oriented, so "Grand Hotel" is generally a very different sounding release. The music on the album is still unmistakably the sound of Procol Harum though. Gary Brooker´s strong voice, distinct vocal style and melodic and memorable vocal lines are as always thecenter of attention, but if you focus on the instrumental side of the band´s music there are great things to be discovered too. 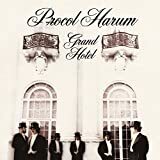 The music on "Grand Hotel" is probably the most progressive oriented on a Procol Harum album since "Shine On Brightly (1968)". The guest appearance by The Pahene Recorder Ensemble provides the music with the above mentioned symphonic element and fans of symphonic prog rock are recommended to check out this album. There are 9 tracks on the album which are all well written and for the most part quite adventurous. In the most challenging department we find the title track with it´s grand sound featuring classical orchestration, choir singing and a waltz section and "Fires (Which Burnt Brightly)", which in addition to classical orchestration also features the beautiful soprano voice of Christianne Legrand. The silly/jolly sounding "A Souvenir of London" which features a rythm which is played with spoons and lyrics that can almost only be interpreted as being about venereal disease, wasn´t an instant hit with me, but even that track has grown on me and has become a decent listen. If anything, it´s nice for the variation on the album. The musicianship is excellent on the album. The dominant piano and the extensive use of organ has always been trademarks in Procol Harum´s sound and those features are as dominant as ever on "Grand Hotel". The departure of guitarist Robin Trower has meant that there are fewer bluesy licks in the music but new guitarist Mick Grabham is a good replacement who´s playing style to my ears actually suits Procol Harum´s music better. The rythm section are very well playing too. Drummer Barrie James Wilson´s energetic style is a real treat. The production is professional and very well sounding. 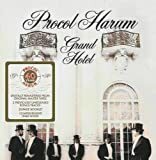 It´s by far the most well sounding production on the first six albums by Procol Harum and all in all "Grand Hotel" is an excellent album by Procol Harum. It shows great progression and innovation from their last studio album (which was excellent too, but featured a very different sound and style) and fully deserves a 4 star (80%) rating. One might argue that Robin Trower hindered more than helped along the Procol cause. He arrived after the first smash hit and left before their second. It's doubtful the hit live album would ever have been realized while he was in the group. The best evidence that his departure took PH up a notch is in this studio follow up to the anemic "Broken Barricades". "Grand Hotel" is elegant from its title on down. Perhaps a bit too aristocratic at times, choosing ornate over unaffected more than called for, it contains the strongest songs on a Procol album since their debut, and a refreshing stream of Gary Brooker's best career piano work. The lyrics are provocative always, but here they actually make sense. The ditties are superior to the highlights on "Barricades". The new guitarist Mick Grabham has unfortunately that same fuzz bucket style that Procol seems to demand, but thankfully he is suppressed more often than his predecessor (not counting David Ball who was only on the live album). The title track exhibits all the positive and negative facets of the album, but, like most here, tips to the plus side of the ledger, especially thanks to the classical allusions and Russian styled passages. My favourites are "Rum Tale", which seems to encapsulate all the best aspects of the group's earlier work, the catchy and insightful "TV Caesar", the organ dominated "Bringing Home the Bacon", and the uber-elegant "Fires Which Burnt Brightly", with its near Haslam like noodling by soprano Christianne Legrand. But even the snide commentary of "Souvenir of London" and "Toujours L'Amour" work for me in their way, the latter including Grabham's best work along with "Bacon". While the very modest success of "Grand Hotel" suggested that the smash of "Conquistador" represented a last gasp rather than a commercial resurgence, this album simply exudes class in the way of a fine wine or opera. Such is a rarity in rock. But like much art of this type, the emotional impact is somewhat wanting, so I must round down to 3 stars to make this accommodation. 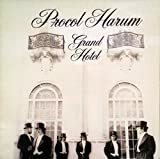 As the title and the snooty cover art imply, Procol Harum find themselves far away from the psychedelic scents of their early years on Grand Hotel. Instead, the band try their hand at symphonic flavoured prog-pop of the sort which, to be honest, Supertramp would pull off rather better in subsequent years, but it's still an interesting listen which will tickle the fancy of those prog fans who like a little pompous, stately elegance to their prog - particularly if you don't insist on prog bands striving for complexity above all else. Although they were prog pioneers back in the 1960s who blazed a trail for subsequent acts, by 1973 Procol Harum were far from the cutting edge, with even major commercial acts like Yes and Genesis being substantially more experimental at that point in time, but wisely Procol here stick to what they know and offer a refinement of their early proto-prog style which clearly evolves their music whilst at the same time sticking to their strengths. For some listeners, this will be too little too late, and certainly whilst they are just about treading water they aren't really breaking new ground here. In my opinion, this is PROCOL HARUM`s most solid album from start to finish, with a lot of Progressive Rock arrangements, and it is maybe their most Progressive album. Maybe it also has some "pompous" and "bombastic" arrangements, but it is very good anyway. Even the cover design is a bit "pompous", but maybe this band always has had a tendency to it in many ways, even with Keith Reid`s lyrics. With Gary Brooker being the founder (with Reid) and the only original musician which remained from the original line-up of the band, he was by then the only composer of the music of the band, and he took the music direction and the control of the band in a right way, supported by a very good line-up of musicians which by 1973 had a new guitarist (Mick Grabham) and this line-up remained unchanged until 1976. In fact, this line-up came to my country to play some concerts at the "Auditorio Nacional" in Mexico City and in Guadalajara (another city in in my country) in late August 1975, and it seems that it happened because they were asked to play here by the then President of my country because one of his sons liked this band. Even the concerts from Mexico City were recorded and some parts of them were broadcasted in the then goverment`s TV channel (Canal 13, later privatized in 1993) in two one hour programmes in two sunday evenings in late 1975. All these things were by then very rare things to happen in my country because during the seventies Rock music concerts were mostly considered as being "out of the law" by the goverment, and the gigs from Mexican bands were done mostly as "clandestine" things. Also, some parts of the audience almost always caused riots, and it seems that some of this happened at the concerts that this band played in Mexico City, but it seems that there were not very big riots. I was ten years old then, and I did not attend those concerts, but some of my brothers, cousins and their friends went to one of those concerts. I only watched to both TV programmes, and one of my brothers recorded them in cassettes (from the TV speaker) which don`t work anymore. But anyway, I remember that the band played the "Grand Hotel" song in concert here, sounding very well. I like all the songs from this album, which also include some humour in some songs like "A Souvenir of London" and "Bringing Home The Bacon", and even some Tango music arrangements in the title track. There are some orchestral arrangements done by Brooker for several songs, and in "Fires (Which Burnt Brightly) " there is a French soprano singer called Christianne Legrand singing a very good vocals arrangement. "Toujours l'Amour", "A Rum Tale" and "T.V. Ceasar" include some "heavy" playing by the band. New guitarist Grabham sounded very well integrated to the band`s musical style and sound. 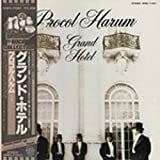 Post a review of PROCOL HARUM "Grand Hotel"